Wild Valley is the only unlockable golf course in Mario Sports Superstars. 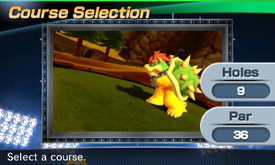 It is unlocked when players clear the Star Cup in the golf portion of the game. The course features more narrow Fairways, strong winds, trickier, more sloped Greens, and many sloped elevations that make traversing this course more difficult than the previous three courses. The course occasionally rains, reducing the power of drives and putting. This course is the one played on when players play the Champion's Cup. Hole 1 Par 4 326 meters A straight course with a curving Fairway that takes players to a narrow strip of uphill Green. Hole 2 Par 5 409 meters This course takes players uphill, where they need to hit the ball onto a highly elevated piece of Green on the top of the hill. Hole 3 Par 3 129 meters Players need to shoot the ball onto a drastically lower elevation, down a wide hole onto the Green. Hole 4 Par 4 358 meters A large rock obstructs the path of the ball, where players need to hit around to reach the Green, which has very sloped areas. Hole 5 Par 4 337 meters A notable feature of this course is a large tree on the center of the Fairway. The Fairway past the tree slopes downward into Bunkers if players hit too far. Past the tree is mostly Fairway and a small area of Green. Hole 6 Par 4 380 meters On the right of the course is a large Bunker trap while the left of the course has a tall cliff obstructing the path towards the Green. Hole 7 Par 3 142 meters Players need to hit the ball on a tall, highly elevated island, where it strongly curves downward, if players hit the ball too weak or too strong. Two Bunkers surround the Green, additionally. Hole 8 Par 4 356 meters The course features narrow Fairways that curve around a large cliff to the north and Bunker traps to the south. Hole 9 Par 5 414 meters The longest course in Wild Valley is also the last one. Players need to hit the ball past ruins of arches and pillars, going downhill, then across a large amount of Fairway and more pillars in the middle of the Fairway uphill, which obstruct the path towards the Green. This page was last edited on January 18, 2018, at 13:38.